Create a sophisticated presentation at your next catered event or special meal with the Royal Collection of plastic plates. Unique blue and silver royal border gives this heavyweight plate a distinct and charming style that combines the convenience of plastic with the elegant appeal of China. Available in 10.25", 9", 7.25" plates and soup and dessert bowls. 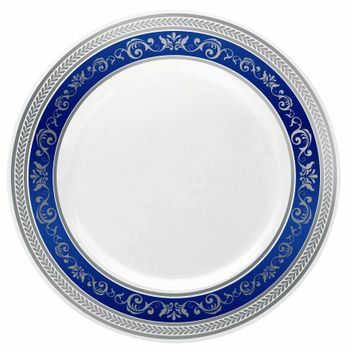 Royal Collection 10 1/4" White w/ Blue and Silver Royal Border Banquet Plastic Plates 10ct. Royal Collection 9" White w/ Blue and Silver Royal Border Luncheon Plastic Plates 10ct. Royal Collection 7.25" White w/ Blue and Silver Royal Border Salad/Dessert Plastic Plates 10ct. Royal Collection 12oz. White w/ Blue and Silver Royal Border Plastic Soup Bowls 10ct. Royal Collection 5oz. White w/ Blue and Silver Royal Border Plastic Dessert Bowls 10ct. Royal Collection 10oz. Clear Plastic Cup with Blue and Silver Royal Border, 10 ct.
Royal Collection Clear Plastic Wine Goblet with Blue and Silver Royal Border, 10 ct.